Hypertension can be the cause or the result of renal disease. It is often difficult to differentiate between the two on clinical grounds. Routine tests as described should be performed on all patients, but IVU is usually unnecessary. A guide to which patients should be fully investigated is given. In benign essential hypertension, arteriosclerosis of major renal arteries and changes in the intrarenal vasculature (nephrosclerosis) occur as follows: IN SMALLVESSELS AND ARTERIOLES, intimal thickening with reduplication of the internal elastic lamina occurs and the vessel wall becomes hyalinized. IN LARGE VESSELS, concentric reduplication of the internal elastic lamina and endothelial proliferation produce an ‘onion skin’ appearance. REDUCTION IN SIZE OF BOTH KIDNEYS may occur; this may be asymmetrical if one major renal artery is more affected by atheromatous change than the other. ARTERIOLAR FIBRINOID NECROSIS occurs, probably as a result of plasma entering the media of the vessel through splits in the intima. FIBRINOID NECROSIS in afferent glomerular arterioles is a prominent feature. FIBRIN DEPOSITION within small vessels is often associated with thrombocytopenia and red-eel! fragmentation seen in the peripheral blood film (microangiopathic haemolytic anaemia). Microscopic haematuria, proteinuria, usually of modest degree (1-3 g daily), and progressive uraemia occur. If untreated, fewer than 10% of patients survive 2 years. 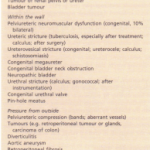 Management of benign essential and malignant hypertension is described. If treatment is begun before renal impairment has occurred, the prognosis for renal function is good. Stabilization or improvement in renal function with healing of intrarenal arteriolar lesions and resolution of microangiopathic haemolysis occur with effective treatment of malignant phase hypertension. Lifelong follow-up of the patient is mandatory. Hypertension commonly complicates bilateral renal disease such as chronic glomerulonephritis, bilateral reflux nephropathy (chronic atrophic pyelonephritis of childhood), polycystic disease and analgesic nephropathy. Two main mechanisms are responsible: Activation of the renin-angiotensin-aldosterone system 2 Retention of salt and water with impairment in excretory function leading to an increase in blood volume and hence blood pressure. The second of these assumes greater importance as renal function deteriorates. Hypertension occurs earlier, is more common and tends to be more severe in patients with renal cortical disorders such as glomerulonephritis than in those with disorders affecting primarily the renal interstitium, such as reflux or analgesic nephropathy. Management is described. Good control of the blood pressure is necessary to prevent further deterioration of renal function secondary to vascular changes produced by the hypertension itself. Unilateral renal ischaemia results in a reduction in the pressure in afferent glomerular arterioles. This leads to an increase in the production and release of renin from the juxtaglomerular apparatus with a consequent increase in angiotensin II. 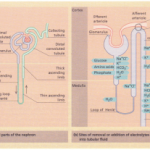 Physiological changes in renal artery stenosis In unilateral renal artery stenosis, renal perfusion pressure is reduced and nephron transit time is prolonged on the side of the stenosis; salt and water reabsorption is therefore increased. 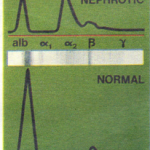 As a result, urine from the ischaemic kidney is more concentrated but has a lower sodium concentration than urine from the contralateral kidney. Inulin, creatinine and p-aminohippuric acid (PAH) clearances are decreased on the ischaemic side. RAPID SEQUENCE EXCRETION UROGRAPHY is still widely employed. INTRAVENOUSLY INJECTED CONTRAST MEDIUM is filtered at the glomerulus more slowly and concentrated within the nephron to a greater extent on the side of the stenosis. Rapid sequence films taken after injection of contrast may show a small kidney and a delayed and denser pyelogram on the side of the stenosis. RADIONUCLIDE STUDIES using labelled DTPA can demonstrate decreased renal perfusion on the affected side. In recent years, the captopril renogram has been employed in this connection. In unilateral renal artery stenosis, a disproportionate fall in uptake of isotope on the affected side following administration of an ACE inhibitor such as captopril has been claimed to be a useful screening test for significant renal artery stenosis. The value of this investigation has recently been called into question. DIVIDED RENAL FUNCTION STUDIES that involve ureteric catheterization are seldom used. RENAL ARTERIOGRAPHY remains the gold standard for the diagnosis of renal artery stenosis. Surgical options in renal artery stenosis include transluminal angioplasty to dilate the stenotic region, reconstructive vascular surgery and nephrectomy. With good selection of patients, more than 50% are cured or improved by intervention. In recent years, increasing interest has focused upon the diagnosis and correction of unilateral and bilateral renal arterial disease with a view to improving renal perfusion and excretory function rather than to correcting hypertension alone. No test can predict the results of vascular surgery and many patients will do well on hypotensive therapy with or without surgery. ACE inhibitors must be avoided as they can lead to acute renal failure in the presence of renal artery stenoses. 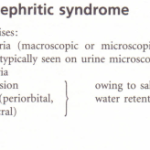 UNILATERAL ATROPHIC PYELONEPHRITIS. In this condition prediction of the outcome after nephrectomy is currently not possible. The case for nephrectomy is strengthened if isotope renography demonstrates the abnormal kidney to be making an insignificant contribution to overall excretion function, particularly if the patient is young and medical treatment has proved unsatisfactory. About one-third of patients with unilateral atrophic pyelonephritis benefit from nephrectomy.